This illustrated book is intended as a compact introduction to the historical study of these objects, which — though removable from the books they cover — are essential parts of those books as published. The present work offers a concise history both of publishers’ detachable book coverings (primarily British and American) and of the attention they have received from scholars, dealers, collectors, and librarians. It also surveys their use by publishers (as protective devices and advertising media) and their usefulness to scholars of literature, art, and book history (as sources for biography, bibliography, cultural analysis, and the development of graphic design). In effect, the book constitutes a plea for the preservation and cataloguing of this significant class of material, so that it will be available for future examination. Following the text is a list of some of the surviving pre-1901 examples of British and American publishers’ printed book-jackets and other detachable coverings. This list, with 1,888 entries, is the outgrowth of a process the author began in 1969: he has kept a record of every pre-1901 jacket that he came across or learned about. 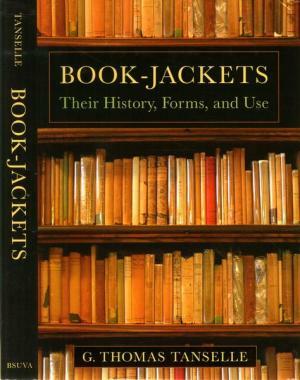 Because surviving jackets from the nineteenth century are scarce (most having been thrown away by the original booksellers or purchasers of the books), and because the large majority of those that do survive are known in only a single copy, it is important to have a listing that indicates their whereabouts, or at least the basis for knowing that they exist or once existed. The list thus provides a guide to the body of evidence on which generalizations about the history of nineteenth-century jackets must be based, until more examples are reported. The book also contains two image sections: the first containing eight black-and-white plates, and the second containing sixteen color plates. The latest forms of book burning are not only wasteful but preventable. Both technological progress and wise policy decisions can save books. (Widespread use of the Gottschalk prismatic camera, for example, which can photograph the facing pages of a book opened at only a 60-degree angle, would drastically reduce the damage from microfilming.) Some segments of the library and scholarly community are beginning to recognize that microfilming and electronic scanning do not fully extract the useful information from books. It is encouraging, for instance, that the Modern Language Association in 1995 gave wide dissemination to a “Statement on the Significance of Primary Records”–with primary records being defined as the objects carrying texts, and not simply the texts themselves. If an organization as influential as the Commission on Preservation and Access were similarly to recommend that libraries keep microfilmed books, that action would be an important step in spreading the message that saving our verbal heritage means saving both texts and objects. In 1847 Augustus De Morgan said, “The most worthless book of a bygone day is a record worthy of preservation.” The study of our intellectual history since Gutenberg depends on our incorporating this point into our plans for the electronic age. Of course, these days book jackets are, in the main, the palette for some very talented designers (arguably the best known of which is the ebullient Chip Kidd ) and the venue for the questionable practice (at least among some literati)of blurbing. Recently The Millions published two amusing and erudite essays on this issue—Alan Levinowitz’s I Greet You in the Middle of a Great Career: A Brief History of Blurbs and Bill Morris’s To Blurb or not to Blurb. Whether the expenditure of a couple of thousand words on this biblio-emphera is of value is, of course, up to the reader. Its worth noting that there is no great groundswell of support for the blurb. As far as I know, no one as expended much energy arguing for the existence of the much maligned blurb. Personally, I find blurbs amusing— as in Harold Bloom’s tribute to William Giraldi’s Busy Monsters. Or when a writer whom I know acknowledges a book— since I have faith that this is a sincere recommendation and not a case of logrolling. By the way the most egregious cases of logrolling are obvious in the movie business (Spy magazine made a career of lampooning Rolling Stone’s Peter Travers’ gushing and ephemeral quotes). And there was the famous case of Sony Pictures fabricating a reviewer and reviews. But that’s a story for another day.